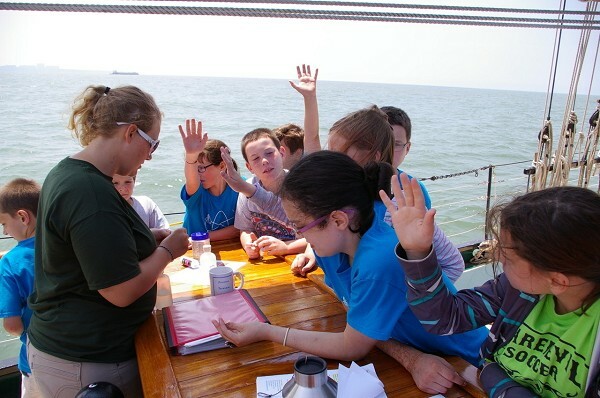 Climb aboard the tall ship Appledore IV for an afternoon of exploring the Saginaw Bay Watershed and one of the largest freshwater resources in the world - the Great Lakes. Sunday, August 19, 4:00 p.m. - 7:30 p.m.
Tickets are $35/adults and $20/students. Snacks, water, and juice provided. Plankton - Use a plankton net to collect samples and later analyze plankton under a microscope while studying their role in the food web. Benthic - Explore the benthic zone by taking a bottom sample with a petit ponar dredge and later search for and identify organisms that indicate water quality. Water Chemistry - Collect a water sample with an alpha water bottle and later analyze samples for pH, dissolved oxygen, turbidity, nitrate, and phosphate levels to determine water quality. Forces in Sailing - Discuss the points of sail that allow a sailing vessel to propel forward. Invasive Species - Identify non-native species and explore their impact on the Great Lakes. Knots - Learn how to tie commonly used nautical knots and why they're important parts of a working vessel.